Almost four years ago I posted a picture of some yellow fruit that I found growing on a tree in Southern California. Today, a discussion of almonds and peach pits turned into a random browse of fruit trees in the family Rosaceae and I found a picture of my mystery fruit: It’s a loquat. And they’re edible. :-) You can’t be serious! Mystery Fruit? Identified? Travel anywhere in the world and you will find that this fruit is available in abundance. As a matter of fact, I have it growing in my back yard. When I lived in Palestine, this fruit was as available as apples or oranges or guava. It’s delicious, sweet and some people even eat it just before it turns orange-yellow when it’s still sour! But there are many fruits that are particular to some cultures that we not be aware of yet. They’re not mystery fruits: just unavailable here and if they are, they will be prohibitively expensive! I only became aware of loquat myself in 2007, when I was on a walking tour of Bermuda. We were walking along the Bermuda Railway (a walking trail on a former railway right-of-way) and our tour guide pointed them out growing wild along the side of the trail. My notes indicate that I found them to have a mild flavour and quite sweet. They were about the size of crabapples. ATW, I guess eastern Canada isn’t part of “anywhere in the world”, eh. :) It looks like the only Canadian area where you might be able to grow the loquat tree would be Vancouver. According to a couple of websites I found, it is more suited to Texas and Florida. 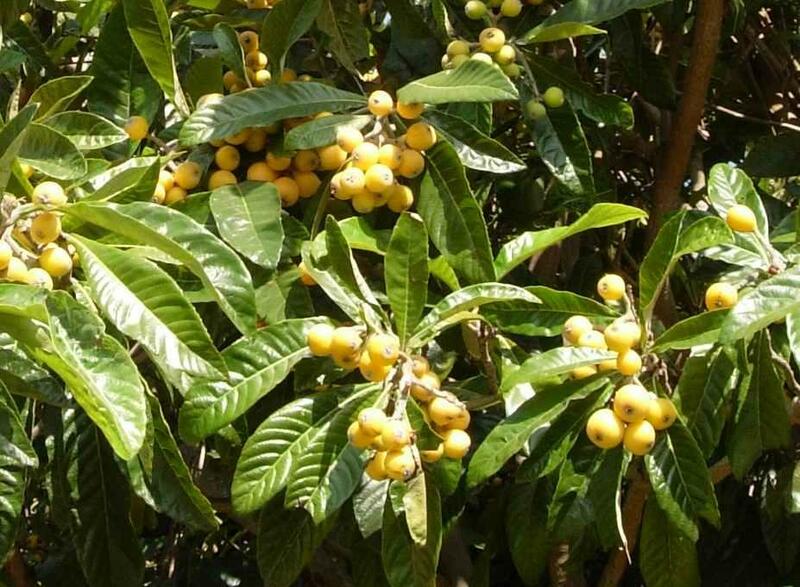 So I think us eastern Canadians can be excused from knowing what a loquat is until we have the good fortune to travel to an area where it grows. Well, exactly! It looks like a small tree with a waxy leaf adapted to a Mediterranean climate. Attendingtheworld might not recognize a blueberry. There are different climate zones. The page that I linked to has lots of unusual fruits such as hybrid “plumcots”–check it out. It’s part of a web site by a retired botany professor who provides lots of diverse biological information in an entertaining way. In my case, the loquat tree was fairly large compared to something like a crabapple tree. From memory, I’d say it was roughly 9-10 metres tall, perhaps. Funny, I thought of blueberries too after posting my last comment. And chokecherries too (grrr, bad memories there, being forced as a kid to pick those little suckers in the blazing sun). And what about maple syrup? Not the fake stuff out of the bottle, but the real stuff hot out of the sugar shack poured on the snow and rolled up on a straw? Mmm. It’s almost that time of year!